A new map gives us an easy way to visualize how languages grew as cultural, economic and religious influences spread around the world. According to the data is this graphic map, the distribution of languages closely follows patterns of human migration, colonization and religious influence. The Romans spread the use of Latin across Europe and the Mediterranean basin as their empire grew. Latin has fallen out of common use but it is still the basis for many of the most frequently spoken languages. The British Empire made English the global language it is today. A total of 335 million people have English as their native tongue; 225 million of them in the United States. 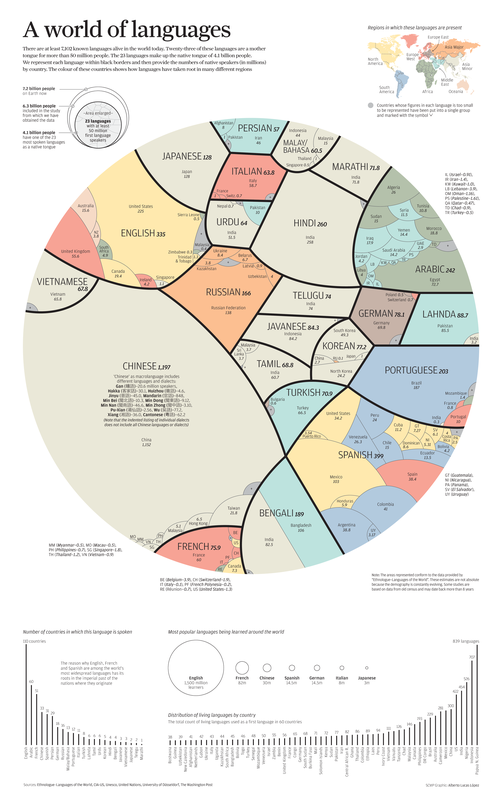 English is spoken in 110 countries, more than any other language. Spain’s colonial history in Latin America left a strong linguistic legacy, too. Spanish is the native tongue in 35 countries and is spoken by 399 million people as a first language. Arabic is another language that has spread far and wide. It is spoken in 60 countries by 242 million people. It became widespread with the conquests of Muslim armies in the seventh century BC, as Islam emerged as a new religious and political force. But the most commonly used language? Chinese, with by far the largest number of speakers. China’s various dialects are the mother tongue of over a billion people. Most of them live in mainland China but there are Chinese-speakers all the way across Asia. With the world again witnessing a mass movement of people, language patterns will evolve even further. But the most popular languages look likely to keep on being the most popular, at least in the near term. So, which languages are people learning? Of the students surveyed, 1.5 billion are studying English and a further 126 million either French, Chinese or Spanish. What successful people were doing at age 25!